"It's simple, I love gorillas. I really feel like the gorillas we care for at GRACE are members of my family! When they are sick, I am worried, just like if my own child is sick. 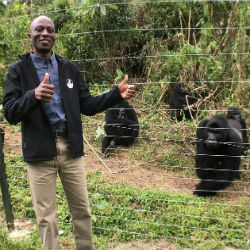 So knowing them and caring about them makes me very motivated for my work,” says Jackson Mbeke, Director for GRACE in the Democratic Republic of Congo (DRC), and winner of Born Free’s Virginia McKenna Award for Compassionate Conservation in 2018. GRACE works to protect and rehabilitate the Grauer’s gorilla, with the aim to return them back to the wild. The Grauer’s gorilla can only be found in the forests of eastern DRC and their numbers have severely reduced in the last 20 years. "My vision is for the Grauer's gorilla population to stop declining and to start recovering," Jackson explains. "We know this can happen because it happened with their close relative mountain gorillas." Jackson’s commitment is inspiring. He started with GRACE from the beginning of the project in 2008. He helped with biodiversity surveys, trained in veterinary sciences, became a logistician to help build the gorilla sanctuary and progressed to Centre Manager, directing all programmes like veterinary, facility, and animal care. 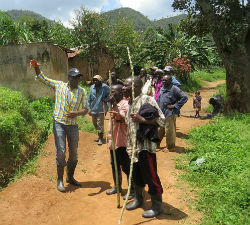 Jackson’s day begins by talking with his staff to plan and evaluate their work with the gorillas. 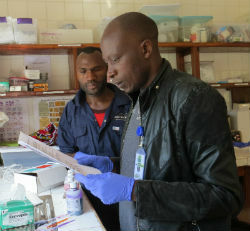 He then goes to his office to do administrative work and review the gorilla reports, which tell how each gorilla is doing from assessments taken three times per day. He also likes to attend gorilla feedings so he can check on the gorillas himself. In the afternoon, he has meetings to co-ordinate and make programme plans. “In the evening, I am often catching up on reports, but I try to always say ‘good night’ to the gorillas,” he says. The GRACE centre is actually built on land donated by the local community and their support has proved invaluable to the project’s success. “The Tayna community set aside its ancestral forest for conservation, so that is remarkable and something I admire. I am proud to now live and work in this community that cares deeply about conservation," Jackson adds. Jackson feels a duty to preserve the gorillas for future generations. "I would like everyone to feel responsible for the conservation of wildlife," he says. "It is everyone's responsibility and we owe it to future generations. I wish we could all work hand in hand for the same objective."